What do women want? What does America need? Men. While 50% of people are male, a male is not necessarily a Man. The transformation of boy-to-man does not happen by accident, but rather through a proven process by fathers, brothers, uncles, grandfathers, and mentors. In the 21st century, most American males haven't access to such character-building role models, so they founder about aimlessly as soft and incomplete males. They have no Purpose, no direction, no zeal. 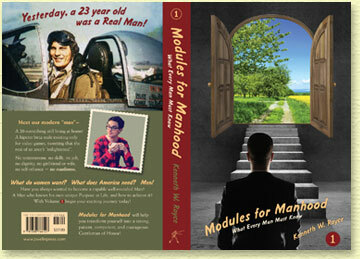 Modules for Manhood will help the reader transform himself into a strong, patient, competent, wise, and courageous gentleman of honor. Our country and our families have been waiting for their Men to return, and their journey is mapped out like never before in our new book. Since the entire text is nearly 1,200 pages, we will offer it in three print volumes as well as ~10 e-books. We are now taking advance orders for volume 1! We anticipate shipping on 20 March.